Can an Accounting Trick Rescue the FDIC? Can an accounting trick save the Federal Deposit Insurance Corp.? That's what FDIC chief Sheila Bair and Co. seem to be hoping. On Tuesday, the cash-depleted FDIC hatched a plan to require banks to prepay three years of quarterly fees. The FDIC expects to quickly generate $45 billion in cash, an amount it normally would've had to wait years to get its hands on. But in a quirk of accounting rules, the banks won't have to expense the upfront payments this year, even though they will be handing over the cash in the next few months  in amounts that could run into the billions of dollars for some banks. The FDIC says the move will solve its liquidity problems  the FDIC officially slid into the red this week for the first time since 1991. 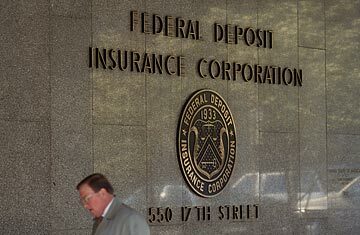 But it's not certain whether the plan will boost confidence in the banking system, as the FDIC seems to hope. For months it had been clear that the FDIC, which maintains a fund to protect deposits when banks fail, would soon run out of money. By the FDIC's own revised estimate, the credit crisis, which has already claimed 95 banks this year, will cost the agency $100 billion. Half of that has already been spent. It's the other half the FDIC is having problems coming up with. As of the end of June, the FDIC had about $10 billion left in its insurance fund. That has put the FDIC in a tough spot. When a bank fails, it is up to the FDIC to guarantee that you'll get back the money (at least up to $250,000) you had in your checking account or savings account or certificate of deposit. If the FDIC fund ran dry, some worry that bank customers would run from all but the most secure banks, causing more bank failures and reigniting the financial crisis. Normally, the FDIC would assess a special onetime fee to banks to raise the money it needs for its fund. But bank executives have been saying that any additional payments they have to make to the FDIC above their normal quarterly bill would force them to cut lending. Special assessments have to be recorded as a cost when they are paid to the FDIC, which reduce bank earnings and capital. It was a capital crunch that caused the financial crisis in the first place. The FDIC's second option is to borrow money from the Treasury Department. This is well within the rules of the FDIC. The agency has a credit line with the Treasury to tap as much as $500 billion in emergency capital through the end of next year. But the FDIC is worried that if the agency, which has always been privately funded through bank assessments, borrowed money from the Treasury, it would look like a new bank bailout, eroding the sliver of confidence the public has regained in our nation's banking system in the past few months. This week the FDIC came up with another solution, which it says will simultaneously boost the fund and not hurt bank earnings or deplete lending. How is it possible that the FDIC's gain will not be a loss to the banking system? It's all thanks to an accounting quirk that allows companies to spend money on something but not actually tell their shareholders about the cost until the asset is gone. For you and me, it would be like shoplifting at the supermarket and then dropping off cash every time you decided to eat something. A can of beans might not cost you anything for years. The rule is supposed to match the revenue generated by the stuff a company buys with its costs, and it is called depreciation. But to anyone other than a CPA, it looks like a sleight of hand. Here's how it will work in the FDIC's case: Later this year, along with their scheduled 2009 fee, banks will pay the FDIC all of the fees that they believe they will owe the agency through the end of 2012. But even though the banks will make those payments this year, they won't show up on 2009 income statements. Instead, each bank will add an asset, a big one, to its balance sheet, right below where the cash they just handed over to the FDIC used to be. It will be called something like prepaid FDIC premiums. The asset will shrink each quarter by the amount each bank normally would have paid the FDIC. As the bank shrinks the asset, it will book the normal cost it would have paid the FDIC in fees that quarter, except as we all know, the fees will have already been paid. In the case of big banks like Bank of America or Citigroup, the upfront payments could run to a few billions. But the FDIC and analysts say banks will be more than able to cover it. Cash flow is not their problem. Capital is. And because the prepayments won't hit earnings, at least not initially, those capital ratios we have been worried about to show if banks are solvent won't change. Banks, all too familiar with accounting tricks, seem overjoyed by the FDIC's solution. "At first I thought there was no way this would fly," says analyst Paul Miller at FBR Capital Markets. "But I talk to a number of bank executives, and they like it." The problem with the FDIC's solution is it does nothing to keep its fund officially out of the red. That's because the same accounting that allows banks to hide the costs will prevent the FDIC from marking up its own assets. Just as the banks get to add an asset to their balance sheet for the money they are prepaying, the FDIC has to book a liability for the money that it has received from the banks but is not actually entitled to yet. That liability will lower the balance of the FDIC's fund by the same amount that it is boosted by the prepayment. That means, at least on the books, the net effect of the prepayment for the FDIC fund will be nada. So even with the $45 billion coming to it, the FDIC will look broke, and probably stay that way until sometime in late 2012. And that raises the question as to how much a boost in confidence the prepayment plan will be to the banking system. "Does it really spook people that the FDIC has a negative number?" says Miller. "To the public, I think, it is less spooking than borrowing from the Treasury. That's why they are doing it. It's a p.r. thing." Worse, many analysts just see this as a short-term fix. Even after banks shell out all of these billions, many believe the FDIC will still not have enough money to deal with the increase in failing banks. "It all works out nicely if the prepayment actually covers what the FDIC needs for the next three years," says veteran bank analyst Ed Narjarian of the ISI Group. "But more than likely, the FDIC is going to be back for more before the three years are out." And the more times the FDIC asks banks for billions to save the financial system, the harder it is going to be to hide.